It is an third party accreditation program intended to assist buyers to be able to have confidence in the engineering, steel products and site specification of the steel shed they are purchasing. The last decade has seen an increase in storms across many areas of Australia destroying sheds and other structures in their path. Site inspections carried out on storm affected regions by teams from the James Cook University at Townsville show many failed structures are not correctly designed to the Building Code of Australia. Wind loads are the main force (apart from snow in alpine areas) a shed must resist. The wind will always find the “weakest link” in a shed. An under designed shed may resist very low wind speeds but is highly likely to fail when subjected to the loads the Building Code of Australia requires it to withstand. To provide guidance for consulting engineers in the correct application design codes, the Australian Steel Institute has produced the Design Guide for Cold Formed Portal Frame Sheds. The ShedSafe accreditation program uses the Design Guide and the Building Code of Australia as the reference documents for the third party review process. 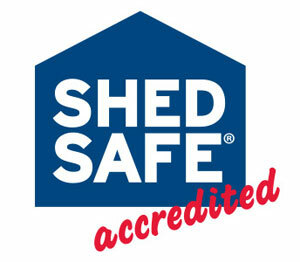 ShedSafe is a two tiered accreditation program, accrediting both the manufacturers responsible for the engineering and design, and the shed sellers responsible for making sure these designs are the best fit for their customers. Shed Manufacturer has undergone a review by an independent third party. This means that the engineering principles, plans and structural calculations used by the Shed Manufacturer have been subject to a design and documentation review undertaken by an independent third party structural engineer and that these have met the ShedSafe criteria. Shed Manufacturer has assured their compliance. The Shed Manufacturer has signed and submitted documentation confirming that all of their shed designs are in accordance with the Australian Steel Institute (ASI) Design Guide Portal Frame Sheds and Garages (2009). Shed Seller will recommend a shed design suitable for your site location and use. This means that the Shed Seller has undertaken training and will recommend a shed with a design suitable for your specific site and building use, based upon the information provided to them by you and/or confirmed through a site visit.